Hi Kathy … I am looking to replace my Bernina 807 which has been a wonderful workhorse for me, but now needs multiple repairs and parts. I won’t part with it, but am considering a replacement … would you know whether the 330 model is comparable? Thanks! I love the Bernina’s and have an old 730 myself! I’ll be perfectly honest, I don’t think any of the modern machines are as sturdy and reliable as the old ones. Having said that, the 330 is an excellent machine and a good replacement. It has more functionality than my old machine and I love the automatic buttonhole feature. 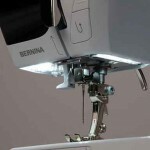 This is an amazing review of the Bernina 330 ! My mother is an elderly lady and her sewing machine that she has used for over 45 years has finally bit the dust. I wanted to get her a new “updated” more “modern” one. I showed her some examples, and also this article. She was AMAZED how technology has even conquered something as small as a sewing machine. She said she would be too scared to use it!! Great stuff! However, I do have many fond memories of the days on the farm while I was growing up, and heard my mom on the Singer machine busy sewing or mending our clothes. 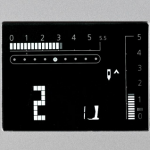 She started off with the basic hand model, and later upgraded to the foot pedal type. Is sewing an art form or a skill that has declined over the last years in your opinion ? Let me congratulate you on your site, and wish you everything of the best for the future. Sewing did decline Theuns, but has been making a big comeback in recent years. What wonderful memories to have, mine of of my Gran mostly hand sewing. She was never able to afford a sewing machine so would borrow one occasionally for big sewing projects like making curtains. My Gran and Grandad had an old Singer sewing machine. One of the really old classics with the pedal starter. She threw it out. Obviously she was really silly because she didn’t know the actual cost of the thing! Anyway, my Mother in law loves to sew so I’ll be directing her to this site as soon as I see her! Lovely website you have here, and very detailed! wow, this looks like an amazing machine! I have an old Bernina that my grandma gave me, it is from the 70’s. It works really well but I need to get a new bobbin for it. I love that machine. I make up-cycled sweaters with a serger because I love that it cuts and finishes the edges. I have a 70s Bernina too! Which model do you have, mine is the Record 730? Bernina really do make quality machines, still a family run business too. I haven’t upcycled any sweaters yet but I have a serger, thanks for the idea Andrea! I can’t say I know anything about sewing but I do know people who sew! Your site would be a great for them to visit if they needed to know about any of the extra accessories they could get with their sewing machine. Or if they are looking to buy a new one. Great page and very informative!! 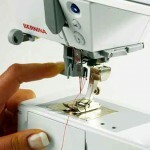 Well it’s always best to do your research before buying any sewing machine and the Bernina 330 is a quality machine. If you ever do decide to take up sewing, it’s a great way to create a unique look for yourself, especially if you upcycle clothes and fabrics!